Indiana Jones and the Last Crusade Genuine Original Cast and Crew Sweatshirt. 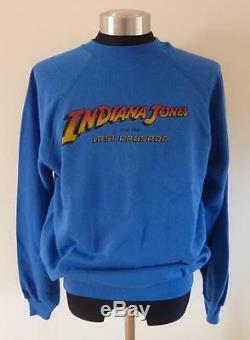 This is a genuine crew sweatshirt used in the production of Indiana Jones and the Last Crusade. I obtained this along with other items from a senior crew member who worked ont he movie. It is in very good condition and size XL 46-48. I will be listing more cool items over the next few weeks, so please add me to your favourites and pop back again. Any questions please see contact details below. You can know follow StarZone on Twitter and Facebook for all the latest stock updates and Star Wars news. We pride ourselves on our excellent customer service and reputation. Tel: 01754 765076 or mobile: 07739 355829. The item "Indiana Jones and the Last Crusade Genuine Original Cast and Crew Sweatshirt" is in sale since Monday, September 14, 2015. This item is in the category "DVDs, Films & TV\Film Memorabilia\Props\Original". The seller is "starzonetoys" and is located in Skegness. This item can be shipped worldwide.